Billy Joel is one of the most successful songwriters and musicians of the last forty years, having sold millions of albums and charted a staggering thirty-three Top 40 hits. Even though he retired from writing and recording albums after 1993's River of Dreams, he continues to sell out concerts around the world and has a huge and devoted fanbase (including yours truly, who will finally be seeing him live this summer). However, for an artist who so often wears his emotions on his sleeve and writes lyrics opening himself up, he's been perpetually misinterpreted and misunderstood over his long career. He's a polarizing musician in the sense that those who love him do so wholeheartedly while his detractors despise him with a passion. Much of the dislike is fueled by the aforementioned misinterpretation, as well as his numerous public setbacks. With that in mind, in 2011 Billy decided to work with author Fred Schruers on an autobiography, but upon nearing completion he decided to return the publisher's advance and kill the project. 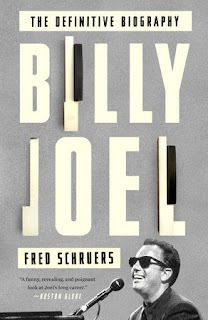 However, Schruers decided to use all of the extensive research and interviews he compiled to write a definitive biography of Billy, the resulting book being the subject of this review. Schruers begins Joel's story with the history of how his family came to America during the run-up to WWII. On his father's side, Billy's family were wealthy and successful Jewish industrialists in Germany who had their business and wealth confiscated by the Nazis and who barely escaped Europe with their lives, coming to America via Cuba when Billy's father Howard was a teenager. Settling in New York City, the family eventually rebuilt their lives and settled into their new country although Howard was always moody and restless, never caring for his new home. On his mother's side, Billy's grandparents were Jews from England who came to the USA around the same time as his father's family. Billy's parents met and got married and a short time later, in 1949, he was born. The family was further augmented when Billy's cousin Judy was adopted as his sister, although Howard's dark moods eventually manifested in him abandoning his family and moving to Austria when Billy was eight years old. Billy's childhood was turbulent as his mother struggled to support them and they were stigmatized as the only poor family in their relatively affluent suburban town on Long Island. However, besides boxing lessons, the one thing his mother made sure to pay for were his piano lessons. Following in the footsteps of his father, who was an accomplished concert pianist, Billy soon developed his virtuoso piano skills as he was bitten by the rock and roll bug in the late 1950s. The real revelation came when he was fifteen and saw the Beatles on the Ed Sullivan Show in early 1964. From there on he swore the only thing he wanted to do with his life was be a musician. After playing in a succession of local rock bands, some of which even recorded a couple of albums, Billy found himself poor and depressed by 1970. The situation wasn't helped by a love triangle between him, his best friend, and his best friend's wife that resulted in two failed suicide attempts. Eventually the wife, Elizabeth, divorced her husband and embarked upon a relationship with Billy. It was then that Billy decided to be a songwriter and to record his songs so he could market them to other artists. However, the recordings caught the ear of Artie Ripp who promptly signed Billy to a contract and funded the recording of his first album, Cold Spring Harbor, which turned into a disaster when it was mastered too fast. After forcing his way out of the contract by laying low and playing anonymously in Los Angeles piano bars under an assumed name (which gave him the inspiration to write his first hit song, "Piano Man"), Billy found himself signed to Columbia Records as he embarked upon a wildly successful career starting with the release of Piano Man in 1973 and culminating with River of Dreams in 1993. Along the way there would be many trials and tribulations, many highs countering the lows, all of which are discussed in detail by the author and Billy during their conversations. One of the strengths of Billy's music is that he's always been very open about his feelings and what he's trying to convey, and that also comes across when he speaks about the various stages of his life and career throughout the book. He's never been afraid to push back against his critics and he spends a good part of the book discussing the inspiration behind many of his songs. A lot of them have been misinterpreted as being "smug," "arrogant," and "misogynistic" (among other labels) and Schruers allows Billy the time to explain why he wrote them and what he was really trying to convey with his lyrics (and reading them on the pages, it's hard to see how the critics could have gotten it so spectacularly wrong unless they didn't want to get it right). He also spends a great deal of time opening up about being a hopeless romantic with a somewhat fatalistic/pessimistic view on love, and he doesn't shy away from discussing his three failed marriages and the numerous relationships in between. Luckily, there's a lot of input from his two most recent ex-wives, Christie Brinkley and Katie Lee, which shed light on their relationships with him and give a deeper view into who Billy is when he's at home away from the stage. He's also quite frank about his struggles with alcoholism and his sobriety. 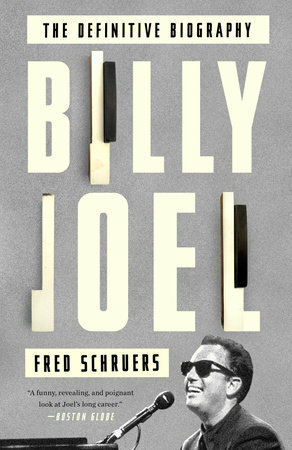 The best parts of the book are when he dissects his own songs and talks about his influences...it's clear that even fifty years into his career, Billy Joel is a musician through and through and still enjoys what he does even though he stopped writing, recording, and releasing new popular music over two decades ago. Where the book does tend to drag a bit is when it continues his story after the final album in 1993. While the discussion of all of the various legal hassles he had after being swindled by his former brother-in-law/manager and his lawyer is interesting and a testament to Billy's (over)trusting nature (he got swindled out of a LOT of his money), the various tales of his battles with Elton John during their joint tours and his ailments got to be a little repetitive after a while. These are minor nits I'm picking, but perhaps if the author had condensed them down a little bit more, then this final section of the book would have flowed a bit better. Otherwise, it was a pleasure to read and it's clear that Schruers is first and foremost a fan as it readily comes across throughout the book. In salvaging the book he was ghosting for Billy, Fred Schruers managed to truly write the definitive biography of one of the great American songwriters and musicians of the twentieth century. Joel has always considered himself more of an Everyman than a rock star and he comes across as genuinely humble and grounded, almost to a fault, across the entire story of his life. He's almost too forgiving and trusting or certain people who have taken advantage of him and even though he still struggles with blue moods, he seems to finally be in a good place in his life. He must be doing something right if he's still selling out concerts and attracting new generations of fans in 2016 and in this book, Fred Schruers gives us an idea of just why this is. Worth it just for the setting-the-record-straight discussions about his songs, yet with so much more to offer, Billy Joel: The Definitive Biography is a book any fan of the Piano Man needs to read.